The next step in the Imagination series . . .
As usual, I lapped up the dirt on all the fat, salt, calories and chemicals in foods like Marie Callender’s pot pies, Campbell’s Soups and the Olive Garden trio plate. But I could only do that because I had imagination, i.e., I can look at the list of 10 Super Foods and imagine a dozen alternatives to the Top 10 Worst that are not only scrumptious but health-giving as well. I don’t have to depend on Marie, Campbell or Olive for food, flavor and comfort at end of the day. For a lot of people, however, those foods are a main source of food, flavor and comfort, so it isn’t so fun to read the dirt on processed foods. 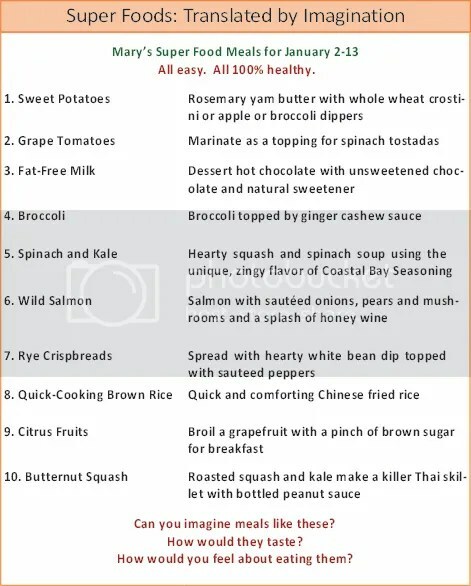 Lacking the imagination to free ourselves from that trap, we look at the Super Food list and think, “Oh great, a dinner of salmon with spinach and brown rice plus fat-free milk to drink. Oh great, crispbreads with oranges for snack. Oh great, frozen butternut squash steamed with kale for lunch.” Faced with that kind of lineup, it’s hard to imagine healthful eating as anything but dismal! What you will gather from this list is that we face a translation problem. 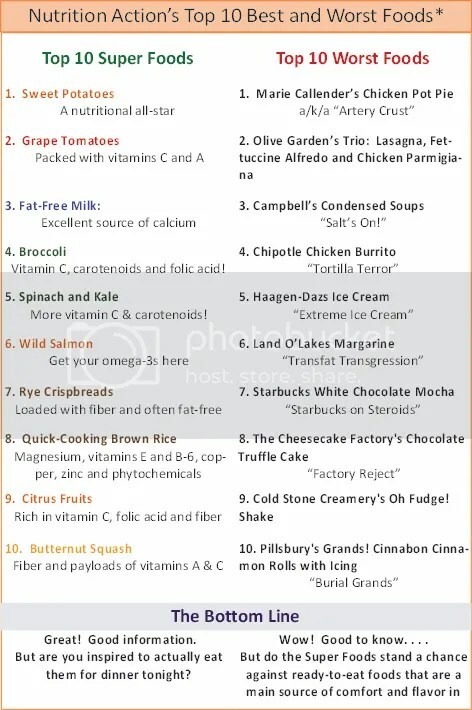 Each of the plain old super foods on the list actually translates into a delightfully delicious dish! But we often don’t know this–and very often can’t even envision it. Imagine a world where healthful meals are as good, satisfying and comforting as a bowl of Haagan Daz or Cold Stone. Imagine eating foods and feeling really good–not guilty–about what you’ve eaten. Imagine that you could experience incredible health by eating deliciously delightful meals. What you need to know is that these imagined scenarios are all true. I can say this with complete confidence because I’ve been in this wonderful world for many years and it only gets better and better. I hope you’ll join me this year–starting with just a leap of imagination. Join us for a Whole Kitchen class where we translate super foods into super meals all the time. Our next series begins in mid-February.